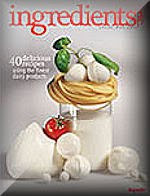 Saputo Cheese has a great free subscription for you - their Ingredients recipe magazine! Filled with great recipes and helpful cooking tips, you won't want to miss an issue. It may even come with coupons.